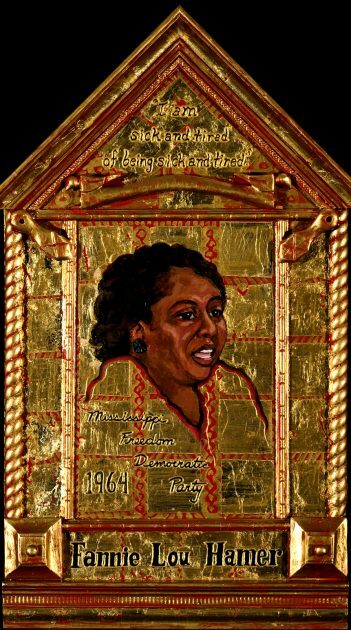 Fannie Lou Hamer, born in 1917, was the granddaughter of a Mississippi slave and the youngest of 20 children. At the age of 6 she worked as a sharecropper in the fields with her parents. She was forced to drop out of school in the 6th grade to work full time to help support her family. In spite of such hardships she became a national figure in the movement for civil rights. As a young woman, she married Perry Hamer, another sharecropper. They adopted 2 children because she had been sterilized in 1961 by a white doctor. It wasn’t until she was 45 years old that she finally decided to register to vote. On a bus she, with others, was arrested on false charges and thrown in jail. After being released, she returned to the plantation and the owner told her that if she insisted on voting, she would have to get off his land. Having worked there for 18 years, she left that day. She became involved in voter registration programs for SCLC and SNCC. In June 1963, Fannie Lou and other civil rights workers were arrested; in jail she was beaten with blackjacks while forced to lie face down. Stricken with polio as a child, she was particularly vulnerable. “They beat me ‘til my body was hard, ‘til I couldn’t bend my fingers or get up when they told me to. That’s how I got this blood clot in my eye—the sight’s nearly gone now. My kidney was injured from the blows they gave me on the back.” The beating left her permanently disabled. Undaunted, the next year she was an organizer of Mississippi’s “Freedom Summer”. She helped form the Mississippi Freedom Democratic Party, an alternative to the all white Mississippi Democratic Party. In an effort to have the MFDP seated at the 1964 Democratic Convention, she testified on national TV before the Credentials Committee about the violence and discrimination faced by black citizens trying to register to vote. The MFDP refused a compromise which would have seated only 2 of its delegates. The Convention did decide, however, that no delegation would be seated from a state where anyone was illegally denied the vote. President Lyndon Johnson signed the Voting Rights Act in 1965. She was elected a delegate from Mississippi to the 1972 Democratic Convention. Known as a powerful speaker with a wonderful singing voice, Fannie Lou lectured extensively often using her famous line: “I’m sick and tired of being sick and tired.” In 1967 her autobiography, “To Praise our Bridges” was published. Suffering from a host of physical ailments and breast cancer, at the age of 60, having accomplished so much in such a short time she died in 1977.